Affiliate Link I work at a mortgage company and for obvious reasons we're not allowed to have the following items at our desks: paper, pens, and/or pencils, newspaper/magazines, cameras--why would I have my camera at work? There is absolutely nothing exciting enough in my office to photograph, but whatevs.--cell phones, mp3 players, etc. Nowhere on this list does it say anything about nail polish, top coats, and feathers. And that is precisely why I was at work doing my nails on a Friday. For the second consecutive Friday. I started with two coats of Sinful Colors Paradise and let dry. Next, I dabbed on Dazzle Dry Top Coat and carefully positioned the feather on my nail and cut the excess off. (I should mention that I did this one nail at a time.) Finally, I commenced this mani with two layers of top coat. If you decide to try this at home, you should wait until your top coat becomes somewhat tacky. Don't worry about smudges. That's what the final additional layers of top coat are for! While I'm on the subject of trying this at home, these feathers are available in five piece sets in twelve colors at BornPrettyStore.com for $1.35. But wait! There's more! Insert infomercial voice-over voice here. You can get these, as well as everything else at Born Pretty, for 10% off using code NCL91 at checkout! 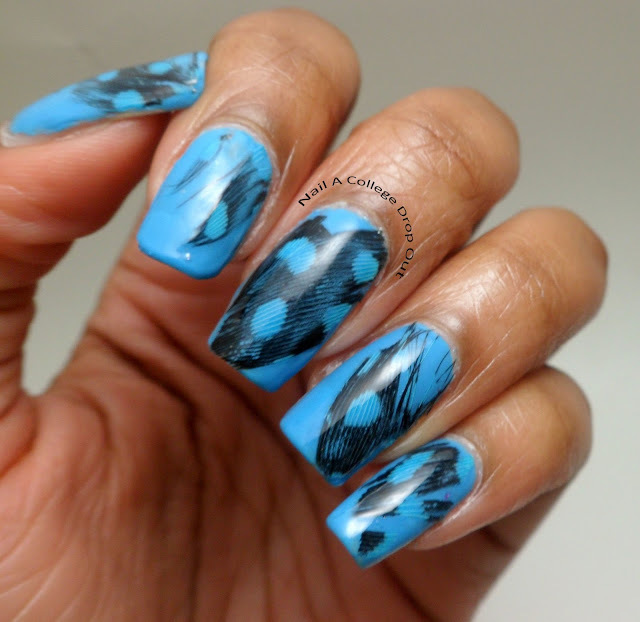 You feeling today's feather nail art? Chime in! I like this! Actually its one of my favs that I have seen. Lol at you doing this at work!!! So cute!